Some of you following the news may be aware that currently a New Zealand whaling activist, Peter Bethune (pictured right), is on trial in Japan for a variety of crimes. 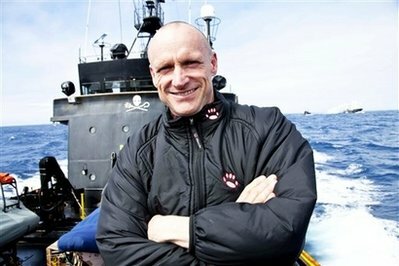 Staying away from the rights and wrongs, credit and blame, the basic outline of the facts of the situation is that Bethune and others from the anti-whaling Sea Shepherd group were in the Southern Ocean to disrupt Japanese whalers (who environmental groups like Sea Shepherd claim are breaking international law with their 'scientific whaling'). There was a collision between a large Japanese whaling vessel, the Shonan Maru 2, and Bethune's much smaller boat, the Ady Gil (formerly the record-breaking Earth Race), shearing off part of the hull and sinking Bethune's boat. Unsurprisingly, each party blamed the other. Later, Bethune climbed aboard the Japanese whaling vessel, attempting to make a 'citizen's arrest' of the Japanese whaling captain, who the Sea Shepherd group blamed for the collision, for attempted murder of the Ady Gil crew. Bethune was detained by the Japanese, and taken back to Japan with them - where he has been labelled a 'terrorist' and put on trial for several crimes, including trespassing, property destruction, violation of the weapons control law for carrying a knife with a longer-than-legal blade (he had a seaman's knife with him for cutting rope), and assault. The latter charge is the most serious, and if convicted he could face up to 15 years in prison. As you can imagine, the whole thing has got very political (Japanese protestors have turned up outside the court wanting their government to 'hang the terrorist' etc). I'll leave that type of commentary to others - although it is interesting that no action has been taken, or charges laid, one way or the other, for the collision (which you would think is a far more serious event) - just largely Bethune's actions in boarding the Shonan Maru 2, and pelting the vessel and sailors with flour-bomb type projectiles earlier. You can read a variety of news stories about the whole situation here. Anyway, from a crime/thriller fiction perspective, it is also an interesting situation because the whaling protestors vs Japanese whalers conflict somewhat mirrors a fairly recent New Zealand thriller novel (from 2007) I came across in the past few weeks, ECHOES IN THE BLUE by C. George Muller (a wildlife biologist). The blurb for ECHOES IN THE BLUE, which I haven't read yet but am looking forward to, says, "Ignoring a 20-year moratorium on commercial whaling, Japan sends its whaling fleet deep into the Antarctic to kill whales under the guise of 'scientific research'. Thrust into this volatile situation is Richard Major, an unlikely hero accompanying a whale research expedition. On the High Seas he must confront a terrifying adversary -- a ruthless fishing industrialist who would wipe out entire species to satisfy an insatiable lust for money and power. From the windswept Southern Ocean to the opulence of corporate Japan, the battle has many fronts. Mirroring a real-life tragedy looming in our own lifetime, this is a haunting exploration of mankind's continual conflict with nature, and the heroism of those who would risk everything to defend a future threatened forever." It certainly sounds like an intriguing premise for a thriller, and given recent events, quite a 'newsy' one too. ECHOES IN THE BLUE hasn't been widely published (it's from a small publisher), but there are still copies available brand new from online bookstores like Amazon.com, Fishpond, Wheeler's Books, and Trade Me, amongst others. It was a finalist (Silver Medal) in the 2007 Nautilus Book Awards, and was criticised as "terrorism" by the Japan Institute of Cetacean Research, the organisation responsible for Japan's whaling programme. 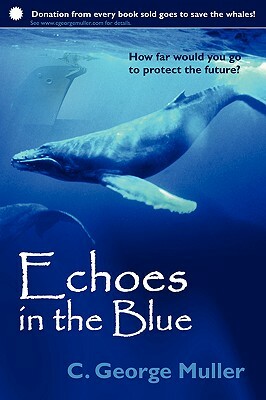 Muller reportedly wrote ECHOES IN THE BLUE to raise awareness and speak out against what he calls, “The illegal slaughter happening just out of sight over the horizon.” His campaign includes a donation to 'Save the Whales' causes for every book sold. He has also set up his website to highlight the issue of illegal whaling and publicise the fight against it. C. George Muller reportedly gave up a well-paying career in the corporate world to "follow his heart and become a professional wildlife biologist". He has a Masters degree in biology, and has been involved in marine mammal research for the past 8 years – with findings published in several scientific papers. He has worked on projects for the US National Park Service, the New Zealand Department of Conservation, and more than one university. Echoes in the Blue was inspired by his experiences on the frontlines of wildlife research and conservation and was written while living and working in Kaikoura, the whale watching capital of New Zealand. Muller’s first novel won the 2005 Richard Webster Popular Fiction Award. So, do you like environmental thrillers? Crime/thriller novels set amongst real-life 'big issues'? Can crime fiction play a part in highlighting issues that may be overlooked or swept under the carpet by the general populace - whether it be domestic violence, child abuse, or whaling? What do you think of political thrillers, or books with a clear political stance? Does ECHOES IN THE BLUE sound like a novel you'd like to read? I'd love to hear your thoughts and comments on this (even political ones). Craig - Issues like this one play a huge role in crime fiction. Novels like Donna Leon's frequently address that kind of issue, and Ruth Rendell's Road Rage does, too, amongst others. I think these issues are so highly charged that they are naturals, so to speak for crime fiction.